One of my classmates put it best last night when she asked the group what do we do with such a place as the Church of the Holy Sepulcher where so many are vying for a piece of the “holy pie”? She’s right. What do we do with a place such as Jerusalem? 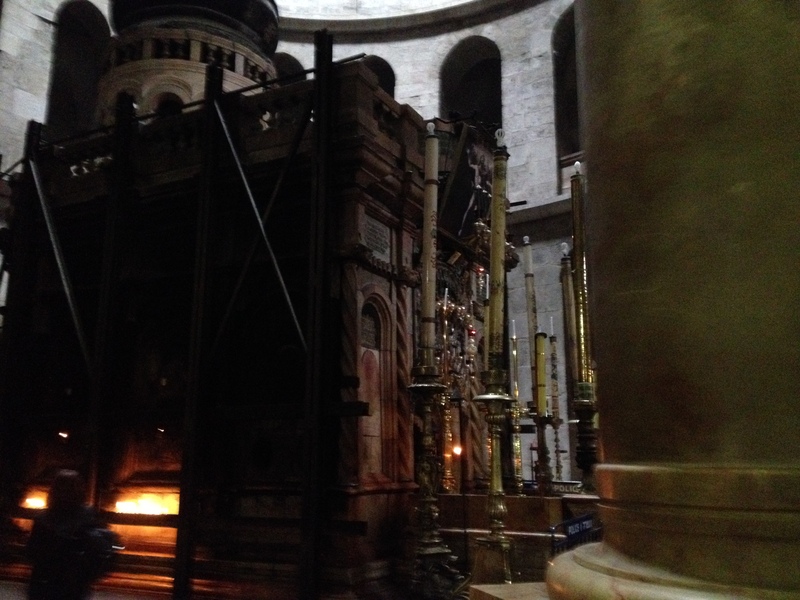 The Tomb of Jesus inside the Church of the Holy Sepulcher where different churches and denominations vie for their right to the claim. Yesterday was our first full day in the city. It was actually a day that felt like a week. 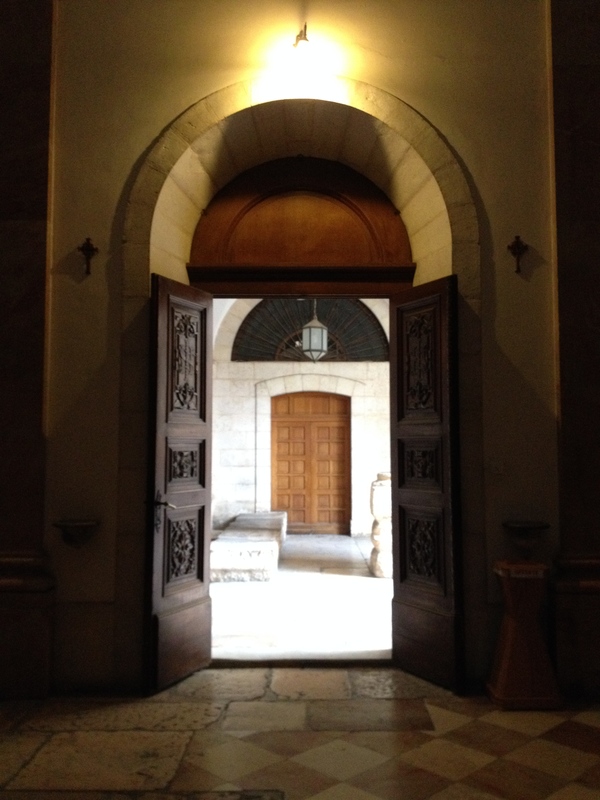 If you read the other blog, you’d know that being in the Old City of Jerusalem is a complete sensory immersion overload. Everything and everyone is vying for your sensory attention at all times as you attempt to focus on the path at hand and follow in the supposed footsteps of Jesus Christ on his death journey throughout the city. All at the same time trying to avoid getting lost in the sea of people that live out their lives in the market. It is overwhelming to say the very least. 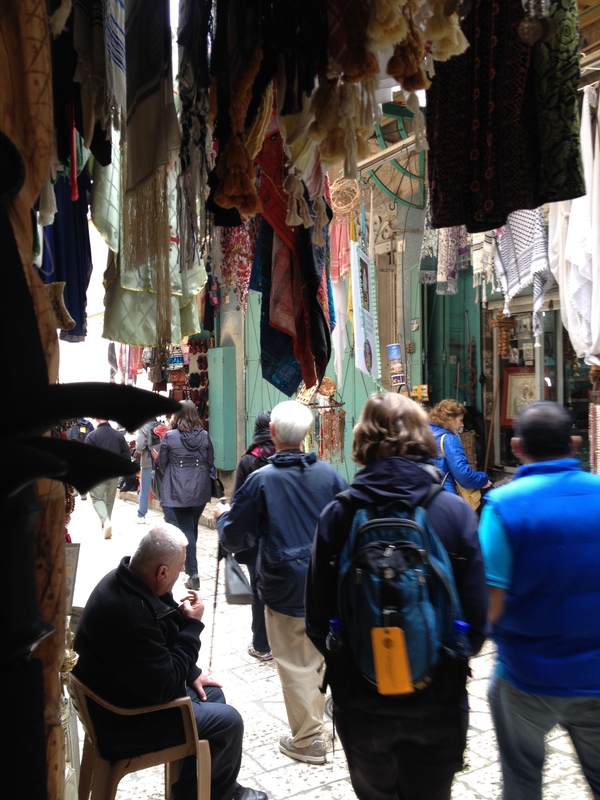 Walking through the market streets on the Via dolorosa. As I walked through the old city, I was in awe at such an incredible place. FedEx doesn’t deliver here friends. This is the place that takes you back in time, where history meets the present, and you are faced with realities that you never dreamed of in your most beautifully sublime nightmares. People are everywhere (if you have social anxiety, this is not the place for you): in the streets selling vegetables and wares, in the doorways smoking cigarettes, in churches praying and making supplication, and in markets waiting to take your last shekel from your hand; all of them vying for your attention. 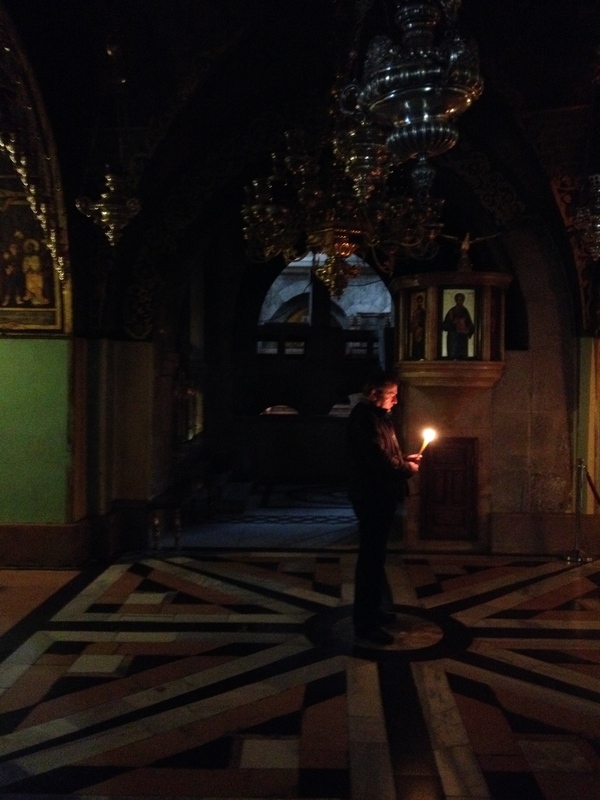 Man praying at the Armenian altar in the Church of the Holy Sepulcher. As I walked through the city, it was impossible to take it all in, so I did so through the lens of my camera. It was the best way I knew how to approach this space. I took pictures as though I were back as an Art History major taking slides for a presentation on architecture, public art, and religious relics for a presentation. It was the safest way I knew how to take it all in and protect myself from being overwhelmed and swept away. I found things that fascinated me, like the doors. 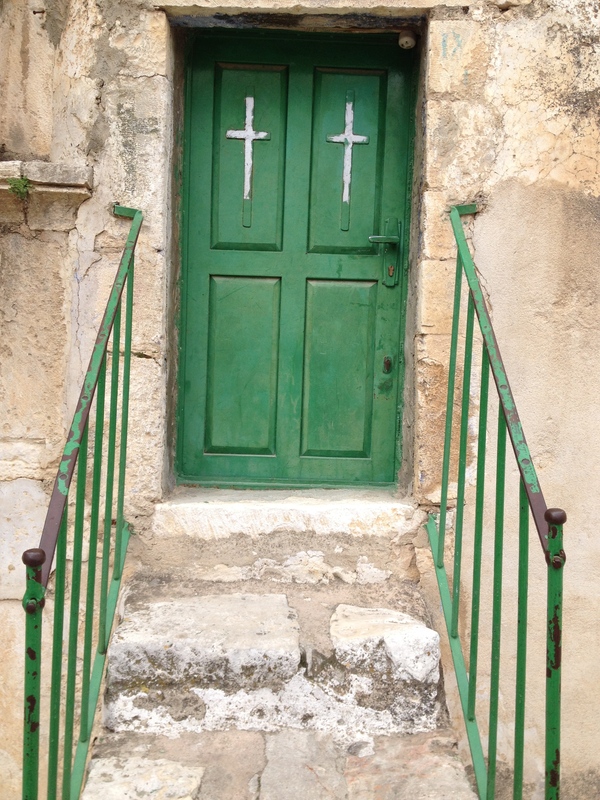 Doors at one of the hap els along the Via dolorosa. In the outer quad of the Church of the Holy Sepulcher. 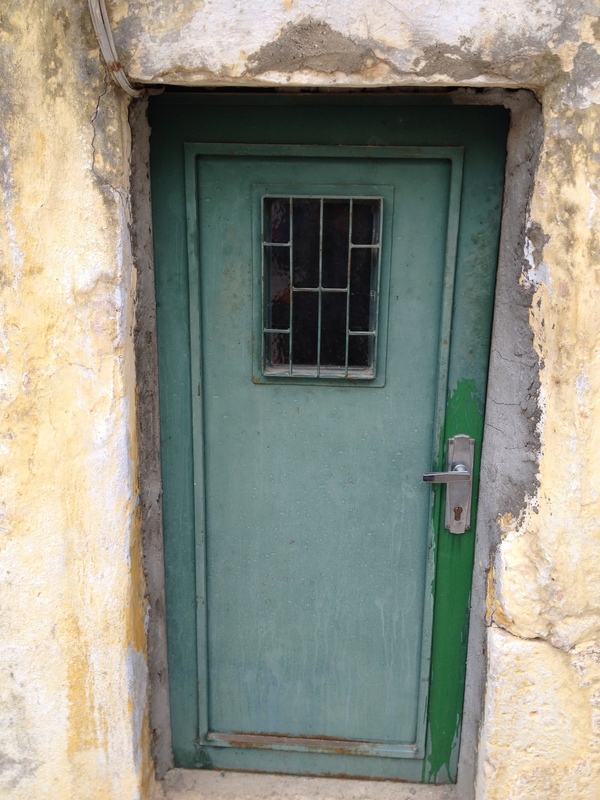 Another door in the same vicinity. 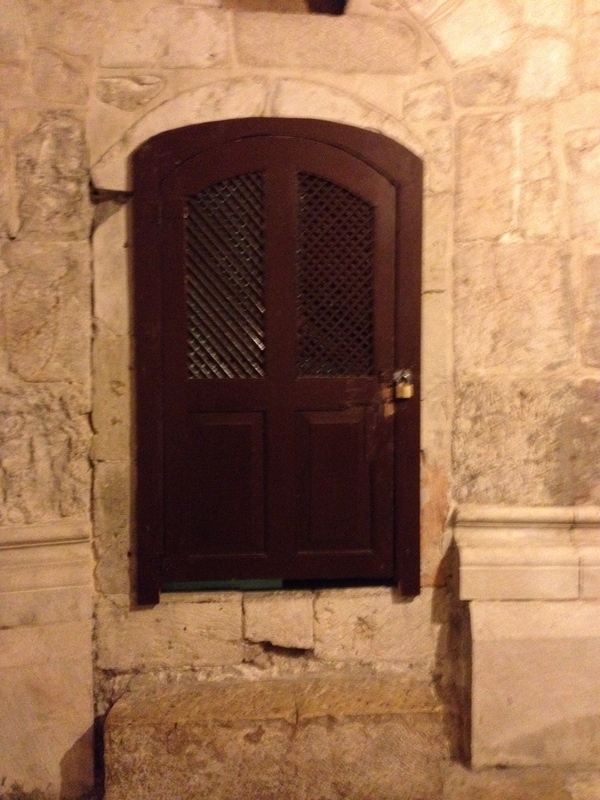 A door within the Church of the Holy Sepulcher. So many of them, and each one leading somewhere different. Each one telling a different story behind it and in front of it. Some open, some closed and locked, some terrifying to see, and others too small for a hobbit to crawl through. But each one led somewhere else. Each one held the story of someone or some group, trying to claim their piece of the pie in this place. 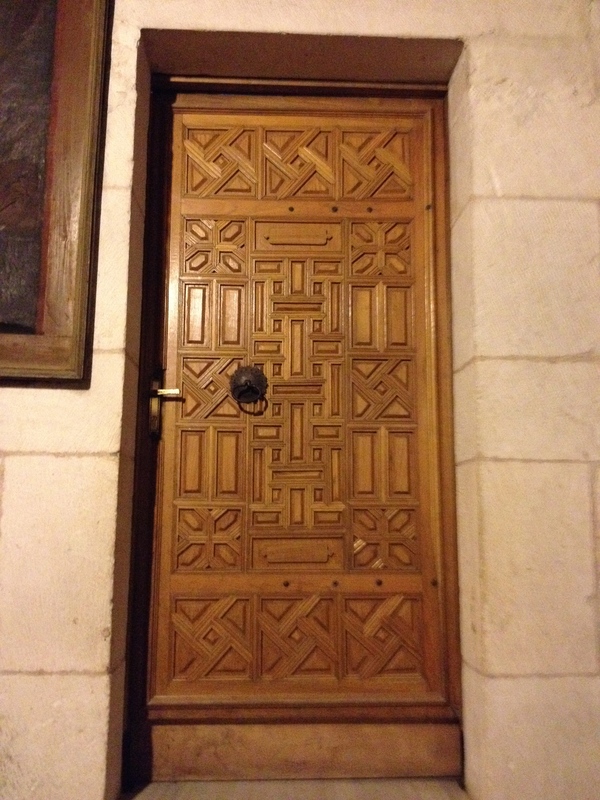 Door within the Church of the Holy Sepulcher. 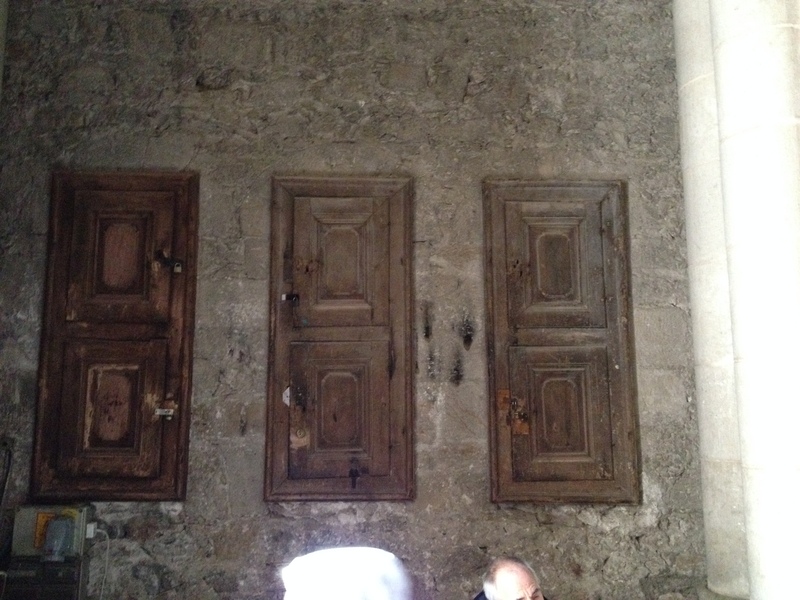 Doors suspended like lanterns as you leave the Church of the Holy Sepulcher. What shocked me the most was my own connection to this place. I always conceived of Jerusalem as a place that was theoretical and magical and unknown to me. I have barely scratched the surface, but I have had the first experience of it. 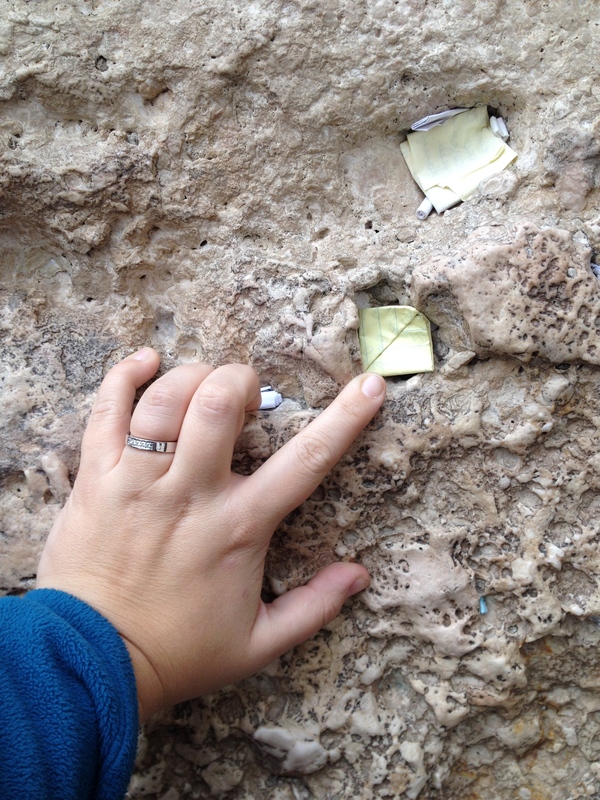 Being here and seeing the Western “Wailing” Wall, hearing the prayers cried out to God, seeing the candles of different religious denominations and Christians who claim ownership of their square inch of space on the floor outside the tomb, seeing the unmoved ladder because no one can agree where to store it or how to move it, seeing the guns in the streets and standing outside of the wall as I prayed to my God; watching as people from all over and varying beliefs pulled and tugged as hard as possible with one another over who held claim to what, was the most overwhelming and saddening experience I have ever had. It hurt because I realized that this place affected me, and what happens here affects me because I am a Christian and I believe in events and people that took place and lived in this place long before I ever existed. I felt a connection I did not expect to feel. It was incredible, and selfishly, I am angered that because of religious pie snatching, the focus of this holy place for people is not about being in the moment with God, Allah, Yahweh; but instead is about who gets what. 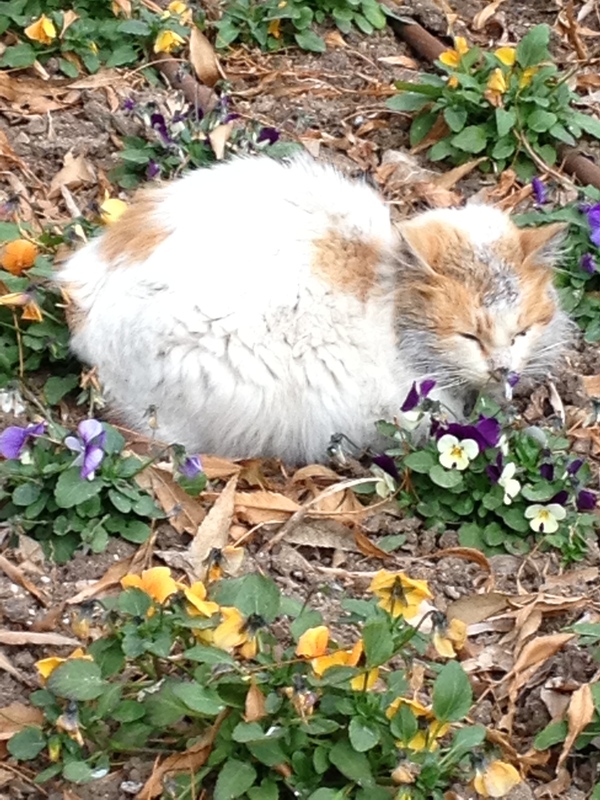 Even the feral cats just want a place to nap in the gardens of St. Anne’s. How do we respond as people who are not from here? How do we support our brothers and sisters, Jews, Christians, and Muslims, as they stake their claim out in this place? How do leave this place? It’s not about how we leave it. We will leave it just as we found it. It is what we take away from it that has changed us or altered us. It is how we use what we have experienced and how we have allowed it to change us. Yes, friends, this was only day 1.